Tired of Sprint garbage 3G speeds? Well if you’re or visit one of the cities below and have a 4G LTE device on Sprint network like the Galaxy S3 or iPhone 5, then you’ll notice faster speeds. 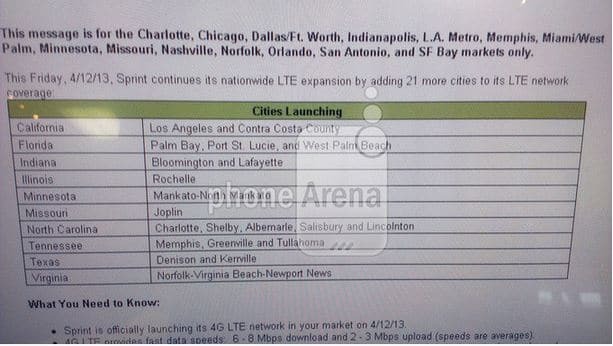 According to a leaked memo from phoneArena, Sprint will officially announce 21 new cities that will be covered (or already are) with their LTE on April 12th. With 4G LTE, Sprint customers can receive download speeds between 6 and 8 Mbps on average, and occasionally 25 Mbps at most.